It's not for everyone, but if you like the Evangelion series and super head-trippy movies, you'll love this DVD. It begins with Bach's peaceful "Jesu, Joy of Man's Desiring" punctuated by spine chilling (AAAHHHH) screams and flashes of destruction. As much I would want it to be, this isn't the same tremendously demented orchestral performance from hell, but instead the menu screen for the End of Evangelion DVD. It's quite a fitting intro for such a unique film as this and the slowly decaying menu items only add to the effect. If you're not familiar with the story of Evangelion, you really should not be watching this movie. Also, by "familiar" I mean you have watched every episode and intimately understand the story, characters and the various biblical references throughout. Only then will you be ready for the movie, and the rest of this review (which will contain numerous spoilers). Is everyone gone now? Alright, I just said that to save time, there really isn't any more to this article because I really didn't think there would be anyone who was that familiar with the series. Just as many people have fake IDs which proclaim themselves as being legal drinking age, I'm sure many of you have also continued reading thinking that there was no way I could possibly stop you. You're WRONG, I know WHERE you LIVE! I will FIND you AND… ahhhh, those horse tranquilizers just kicked in. So, to recap what's happened so far in the Evangelion storyline: All 12 angels have been defeated, Asuka's in a comatose state, and Rei… well, Rei's been reincarnated three times. We wait to see what happens to Nerv, Shinji, and the rest of the flawed cast. 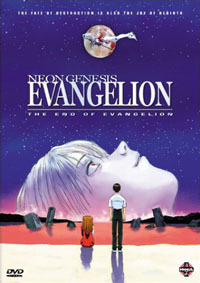 The End of Evangelion movie was created to replace the last two episodes (25&26) of the T.V. series because well, quite frankly, they made NO SENSE. So, after reconsidering (and receiving numerous death threats in the mail) Hideki Anno, the creator of Evangelion, decided to go ahead and create the movie, which most consider to be the definitive end of Evangelion. The movie is divided into two 45 minute 'episodes', "Air" and "My True Love for You". In the first half, we find Nerv under assault by the organization SEELE who want to take the Evangelions to initiate Third Impact. Gendo Ikari on the other hand, has a different idea: He wishes to unite Adam, Lilith, Rei and himself to satisfy his own purposes. He says that he wishes to see his wife again, but perhaps his true motive is to recreate the world on his image. Mistato wants to try to prevent Third Impact from happening and instructs Shinji to destroy the rest of the Evangelion series. Additionally the other governments of the world want to massacre everyone at Nerv and secure the Evas so that Third Impact will not occur. Of course, in this movie, nothing ever occurs as planned. Asuka awakens from her comatose state to discover the 'true nature' of the AT Field and proceeds to use her Eva Prototype unit to demolish the completed Eva series – only to have them revive and start to consume her alive (yum). Meanwhile, Rei rebels against Gendo and refuses to join with him. Instead, she takes Adam into herself and joins with Lilith (becoming BIG Rei). Shinji freaks out at the sight of giant Rei and then it all just goes to hell. The revived Eva series and Eva unit 01 initiate Third Impact, which involves turning everyone into melting orange jell-o. While this is all happening, Shinji is experiencing a tripped out dive into his own consciousness in which he finally accepts himself. This involves scenes of live action life in Japan and some of the most brilliantly freaked out imagery in any movie. It ends with Shinji and Asuka on a beach of lovely white sand and blood-red water. Confused? That was just a brief run through of the events of the movie. You'll need to watch it three or four times just to get a hang of what's really going on. The DVD makes understanding the movie much easier, with tracks in Japanese and English as well as a witty and entertaining commentary track by Amanda Winn Lee (the director of the English cast and the voice of Ayanami Rei), Taliesin Jaffe, and Jason C. Lee. The video quality is also excellent and the audio tracks come in 6.1 DTS or 5.1 Dolby Digital EX surround. Overall, the End of Evangelion movie is not for everyone. But, if you think you're ready for it, (and you've watched and enjoyed the series) be sure to pick up this DVD. It's quite worth the money and you will be watching it at least three or four times. Also, as an added bonus, you can leave it on all day and freak out your non anime-watching friends.